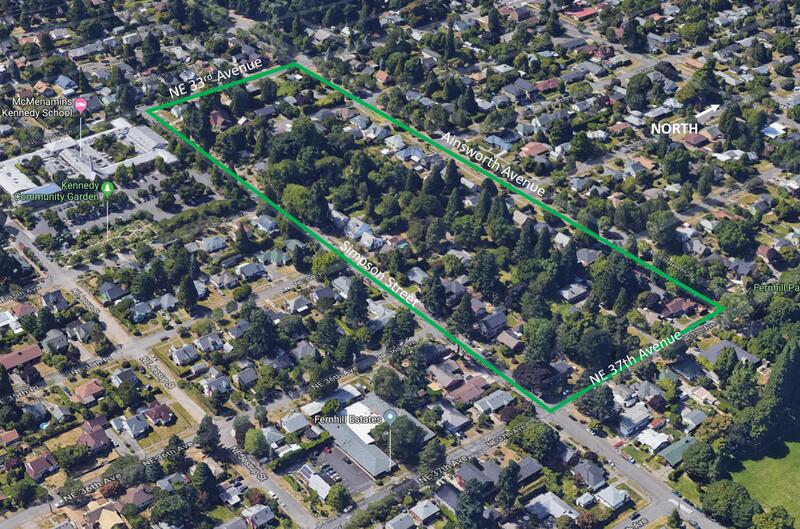 While walking in the neighborhood—the best way to observe history in action—we’ve wondered about the very long block between Ainsworth and Simpson, bounded by NE 33rd and NE 37th. Maybe you’ve wondered too: the north-south streets of 34th, 35th and 36th don’t go through, leaving unusually deep and narrow lots. These kinds of things—like the strange zig-zag on Prescott we call the Prescott Street Jog—make us ask: What’s the story behind that? That’s one long block. A Google image looking northwest at the long block (outlined in green). Note that none of the numbered cross streets, from 33rd to 37th, cross this long block. How come? 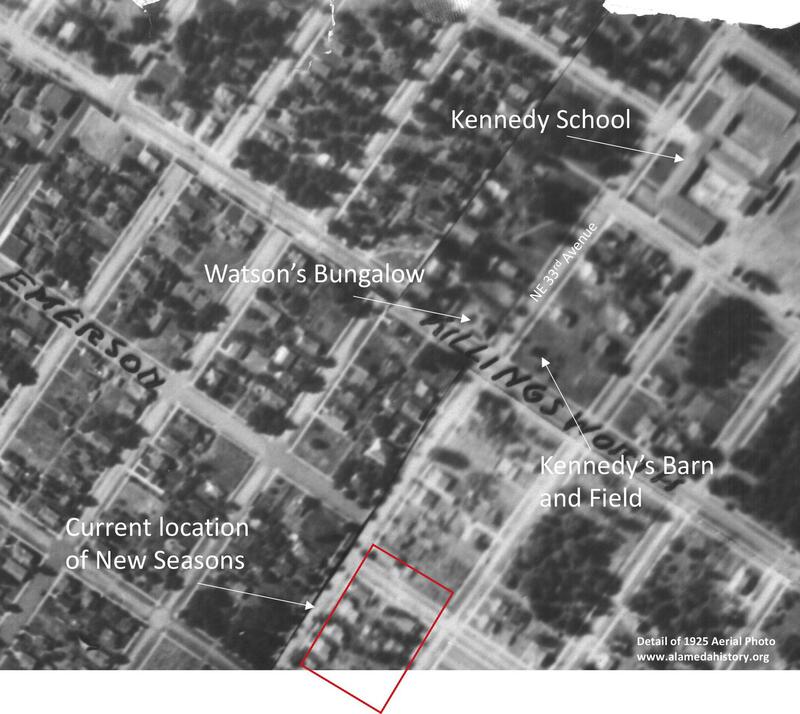 The long, narrow configuration of this block stems from decisions made more than 100 years ago by John D. Kennedy, the man who once owned much of the property between Killingsworth, Ainsworth, NE 33rd and NE 42nd, and for whom Kennedy School was named. 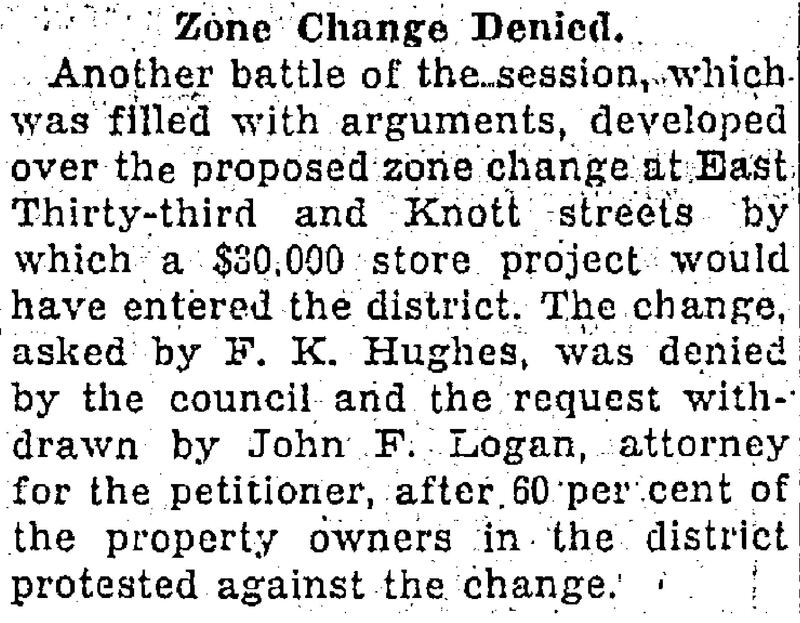 We met John D. Kennedy in our recent post about his 1929 zone change petition to turn nearby residential land at 33rd and Killingsworth into commercial property. Born in County Limerick, Ireland in 1852, Kennedy immigrated to Oregon in 1866, finding his way to Baker City where he worked in and then owned a dry goods store. After coming to Portland about 1881, Kennedy bought this property—then outside the city limits and far from anything that even looked like development—which was originally part of the 1855 Isaac Rennison Donation Land Claim. John D. Kennedy, about 1920. Photo originally from the Ryerson Collection, borrowed here from McMenamin’s Kennedy School. Kennedy was an early-in speculator, perhaps 15 years ahead of his time and the market. 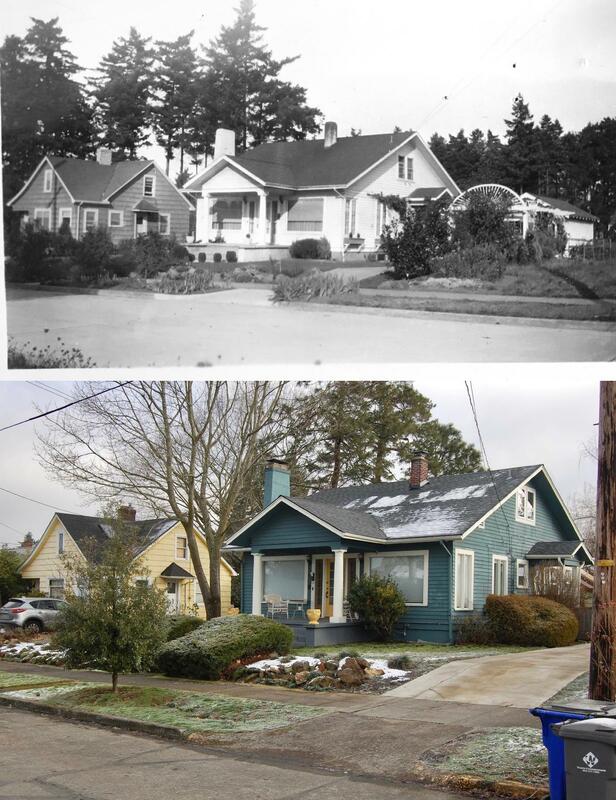 Northeast Portland’s ripeness for real estate didn’t really take place until the years after the 1905 Lewis and Clark Exposition when it seemed anyone who could was buying property or building houses. Kennedy Addition plat filed with the Multnomah County Surveyor’s Office, 1890. The grid survived, even if the street names didn’t. Translation: County Road = NE 33rd; Cleveland Street = NE 34th; Harrison Street = NE 35th; Morton Street (which was built as Marguerite Avenue)= NE 35th Place; Thurman Street = NE 36th; Blaine Street = NE 37th Avenue; Cypress Avenue = Jessup Street; Myrtle Avenue = Simpson Street. Barkholtz was an inholding property owner who wasn’t Kennedy but who went along with the plat. Interesting to note that in later years, that is the one area of the long block where a cul de sac was built. Two years later in 1892, he platted Kennedy’s Second Addition, adjacent to the east, with more street names that didn’t make it to today (Morrow, Gilliam, Hughes and Francis). His Second Addition contained plans for another 120 homes. 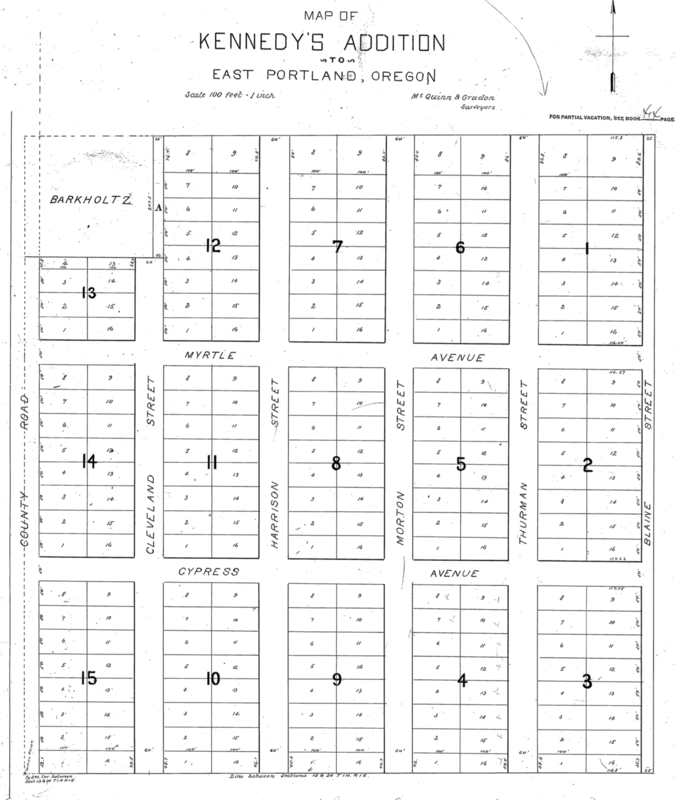 Speculators filed several other nearby plats about that time, including Foxchase, Irvington Park, the Willamette Addition and Railroad Heights, but they were also just lines on paper. There was no market yet for residential development. 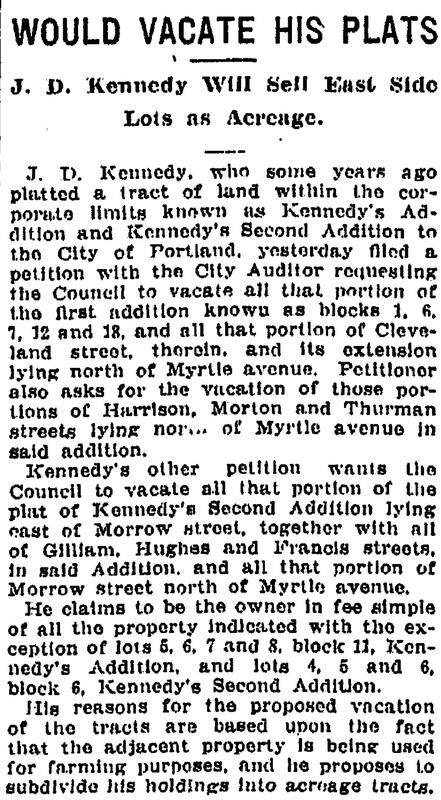 In 1906, Kennedy filed a petition with the city to “vacate” five of the blocks in his addition. The process of vacation officially eliminates platted streets (even if they don’t yet exist), and the 1906 action—approved by City Council in ordinances 15761 and 15762—essentially erased all of the north-south streets (then called Cleveland, Harrison, Morton, Thurman and Blaine, see above) in the block between Ainsworth and Simpson, from 33rd east to 37th. In the years that followed as urbanization spread, neighborhoods were built to the north, south and west, and Kennedy’s smart and early real estate speculation paid off. But the 12-acre parcel, with no north-south through streets due to his 1906 decision to vacate streets from the property, stayed as one big block in farm use. After Portland voters passed a $500,000 park acquisition bond measure in 1919, Kennedy courted the city with the long block tract—a perfect park size at 12 acres—suggesting it would make a great place for playgrounds, picnic tables and ball diamonds. 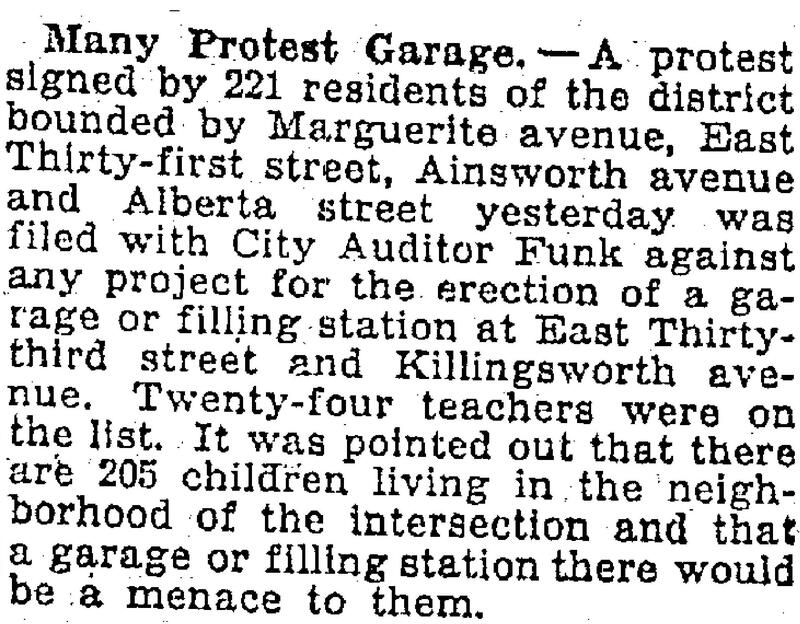 This was long before Fernhill Park or Wilshire Park (which have their own interesting stories well worth reading), and concurrent with consideration of Alberta Park, which was ultimately selected over Kennedy’s tract for purchase and development. Think about that: what if today’s Alberta Park had become neighborhood streets as planned, and Kennedy’s long block was a park? Hmm. 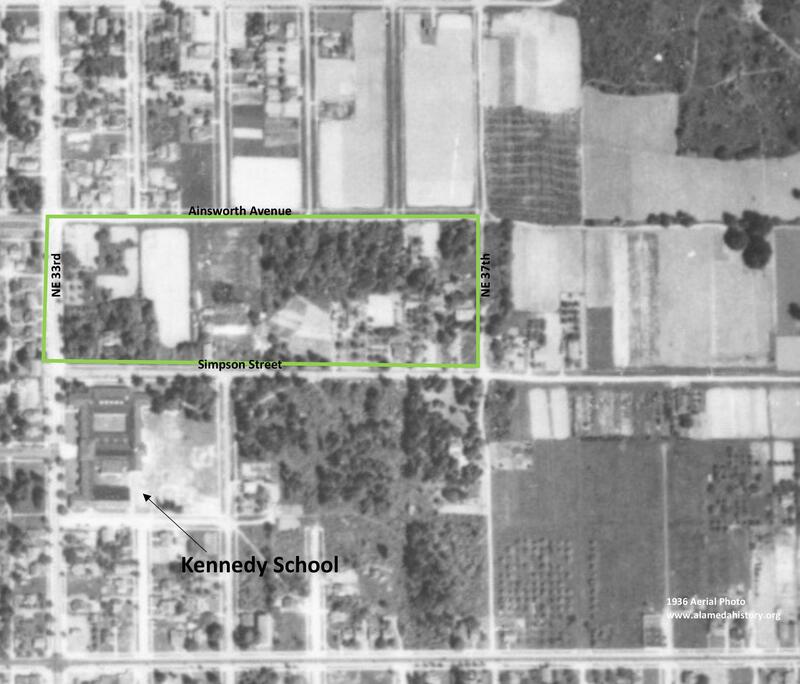 Here’s an aerial photo of the area from 1936 that shows the long block with a few homes, the oldest dating back to 1909…purchased from Kennedy after the 1906 ordinance passed creating the 12-acre parcel. One home, on the Simpson Street side, actually pre-dates Kennedy’s 1890 plat. Detail of 1936 aerial photo. Courtesy of University of Oregon Map & Aerial Photography Library. Detail of 1951 aerial photo. Courtesy of City of Portland Archives. So there you have it: In the original Kennedy’s Addition plat, that one long block was going to be five blocks. But then Kennedy did away with the blocks to better sell the property. The market came and went and came back again. Then another speculator saw opportunity and turned the island of farm into the more than 50 lots there today, most of them a very long and narrow quarter-acre each. 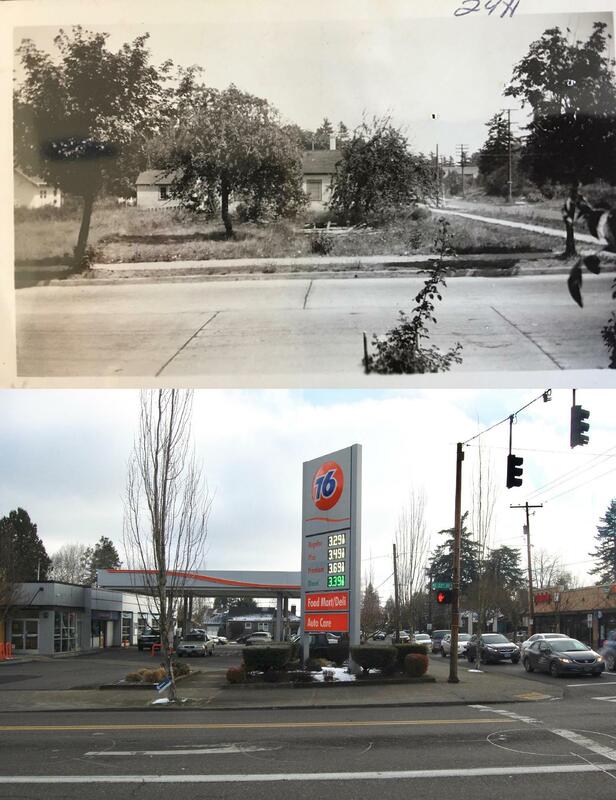 In our ongoing pursuit of insight about the early days of Northeast neighborhoods, we’ve come across a zoning change petition filled with photos and maps from 1929 that allows an interesting glimpse into the evolution of today’s busy intersection at NE 33rd and Killingsworth in the Concordia neighborhood. 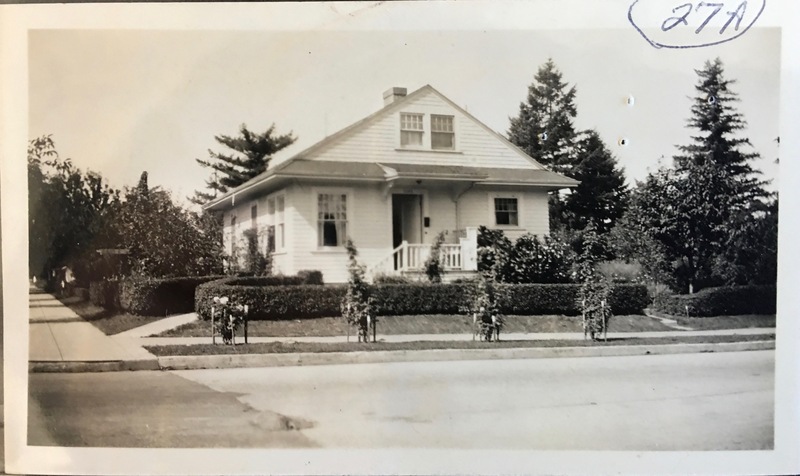 We’ll whet your appetite with this 1929 photo of a fine bungalow, owned by Frank and Louella Watson that was located at the northwest corner of NE 33rd and Killingsworth (facing 33rd), on property now occupied by the Mud Bay pet store. Looking west across NE 33rd at the Watson house, a tidy-looking bungalow surrounded by highly manicured hedges and gardens, that occupied what is now the parking lot for Mud Bay. 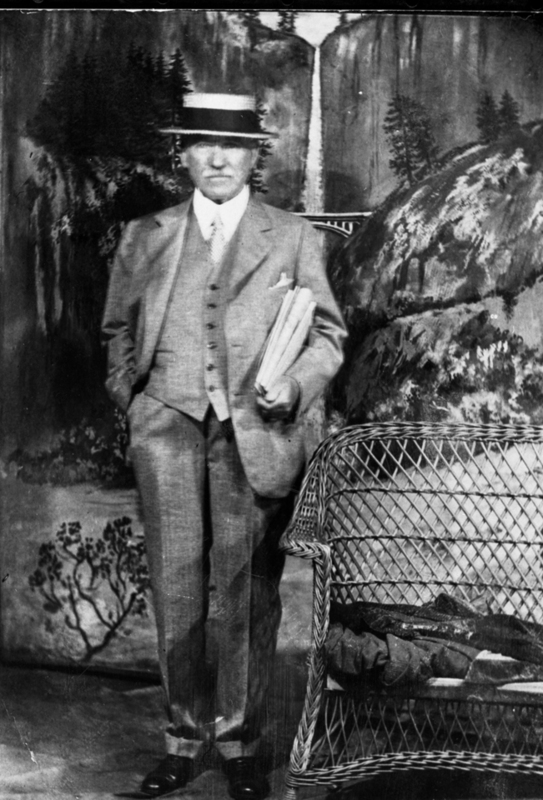 Photo taken on August 15, 1929. The sidewalk running off into the distance at left parallels Killingsworth. Photo courtesy of Portland City Archives, A2001-062.57. 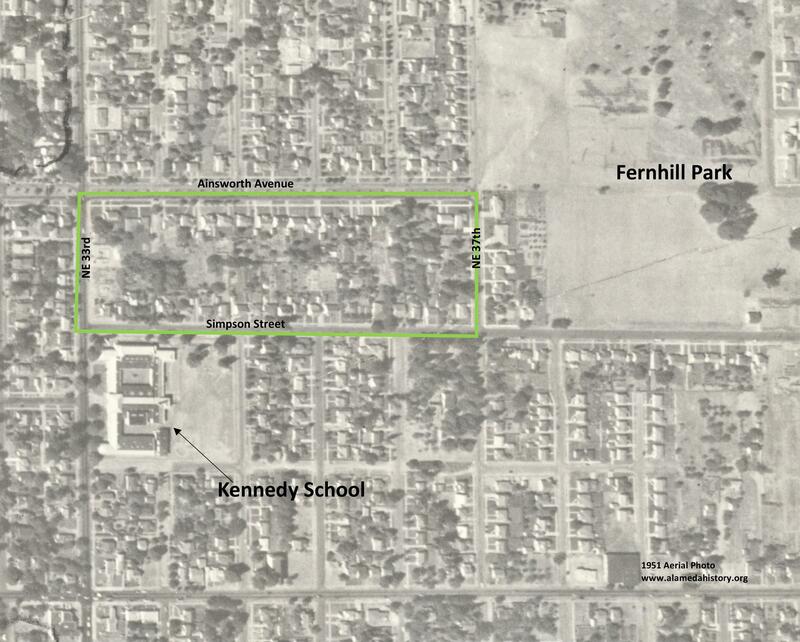 At the turn of the last century, John D. Kennedy owned much of the land between Killingsworth, Ainsworth, NE 33rd and NE 42nd, which he platted as the Kennedy Addition. By 1910, he was carving up the fields into building lots and a handful of houses were being built. In 1913 he sold the city a four-acre parcel that is now Kennedy School, which opened in 1914. Kennedy knew an emerging neighborhood would need a school and he was, after all, in the business of selling lots for homebuilders. The Oregonian reported at the time this part of NE 33rd—which was also known as the Sunderland Road north of Prescott—was still unpaved and mostly used for moving cattle and sheep, and that the surrounding area was heavily wooded with only a few scattered houses. 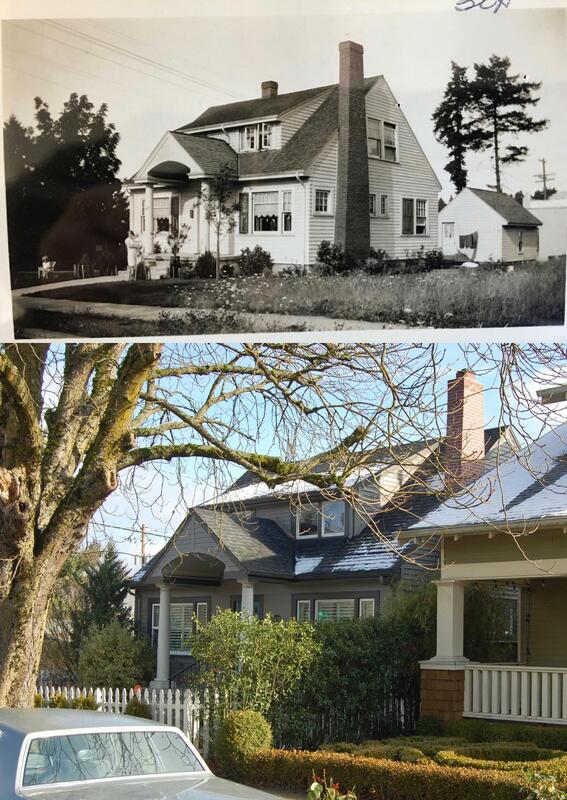 By the mid 1920s, more homes had been built in the area, particularly along NE 33rd. At the southwest corner of 33rd and Killingsworth was a small Red and White Market. At the southeast and northwest corners, bungalows had been built. At the northeast corner of Killingsworth and 33rd pictured below, Kennedy owned an open field that once housed a barn (a kind-of local landmark known as “Kennedy’s Barn”). You can see some of the wood left over after the barn’s demolition. Looking east across 33rd at the open lot at the northeast corner of 33rd and Killingsworth where Kennedy’s barn once stood, June 15, 1928. The street running off into the distance at right is Killingsworth. Taken from the Watson home pictured above. Photo courtesy of Portland City Archives, A220-062.54. Contemporary photo showing the same view today. Even though the area still had a strong rural residential feel, Kennedy could already visualize how things would go: the school and homes were ripe for their own commercial district. So, in the summer of 1929 he put the re-zoning wheels into motion to get his parcel ready for commercial development. Detail of a 1925 aerial photo. Kennedy School is visible in the upper right corner. Kennedy’s field appears just above the “NG” in the original hand lettering on the photo (now a 76 gas station). The red dashed line indicates the location of present day New Seasons Concordia. Click for larger view. Aerial photo courtesy of City of Portland Archives. In 1929, Portland’s zoning code was fairly simple: Zone 1 was for single-family residential use; Zone 2 was for multi-family residential use; Zone 3 was for business and manufacturing; and Zone 4 was unrestricted. 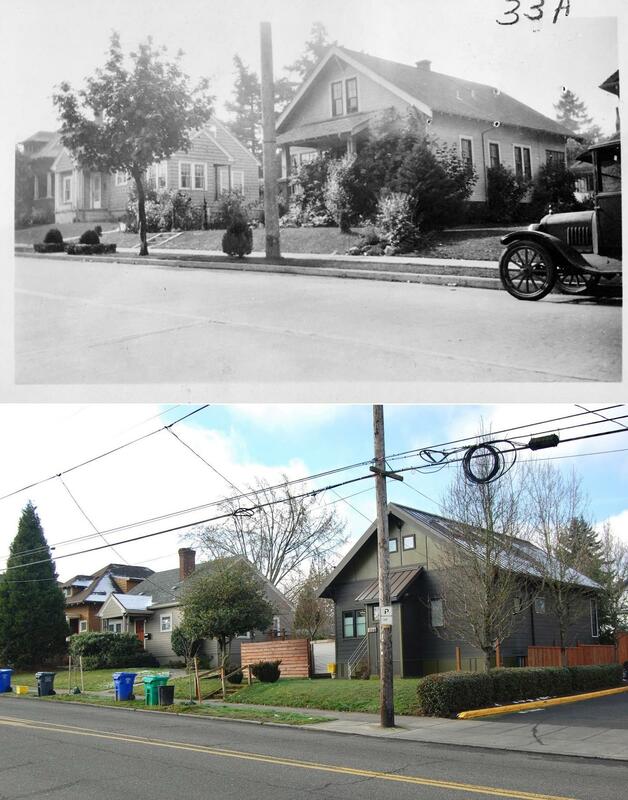 (Here’s a link to a great history of zoning in Portland). Neighbors weren’t wild about the idea. 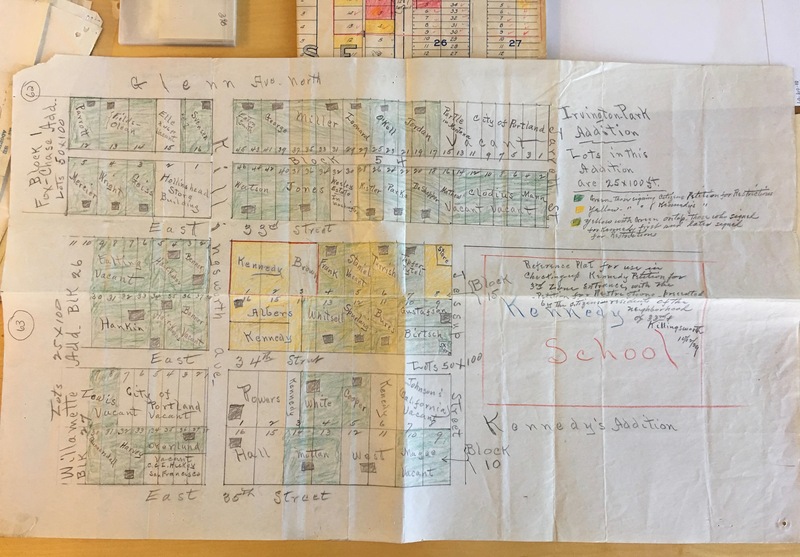 On October 12, 1929, adjacent property owners submitted a hand-drawn and color-coded map that recorded exactly how they felt. Owners with properties shaded green wanted the area to stay restricted to residential. Those shaded yellow were in favor of Kennedy’s petition for zone change to commercial. Have a good look and you’ll figure out pretty quickly which properties were owned by Kennedy. It’s also interesting to note the third category (yellowish green), which were neighbors in favor of the Kennedy petition at first but who then changed their minds. Map drawn by neighbors showing opposition to rezoning of the Kennedy property for commercial use. Click to enlarge. Courtesy of City of Portland Archives, File A2001-062. Here’s where it gets visually interesting. Along with their map, neighbors submitted photographs to help the Planning Commission understand the residential character of the neighborhood and the potential impact of a zone change. We paired these with similar views photographed on a snow day in early February 2019. 5434 NE 32nd Place (formerly 1160 E. Glenn Avenue, the Svensen family home). The southeast corner of NE 32nd Place and Killingsworth. Photographed on August 14, 1929. Courtesy Portland City Archives, A2001-062.60. 5506 NE 32nd Place (formerly 1150 E. Glenn Avenue, the Eaton family home). The northeast corner of NE 32nd Place and Killingsworth. Photographed on August 14, 1929. Courtesy Portland City Archives, A2001-062.61. We wonder if the homeowner realizes the house once had an extended front porch and pergola, and a completely different siding material. 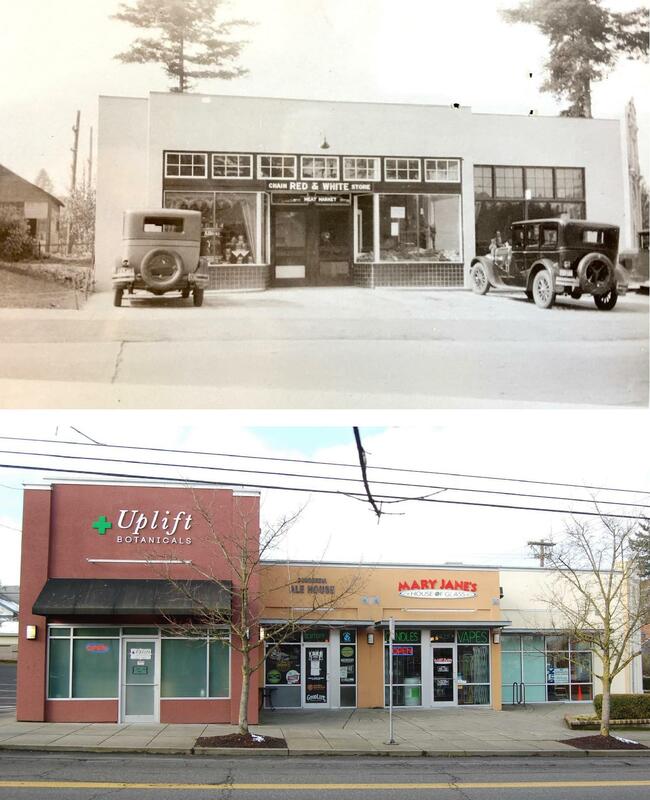 5526 and 5606 NE 34th Avenue (formerly 1166 and 1168 E. 34th Avenue, the Nellie White and C.C. Cooper family homes, respectively). Photographed on September 19, 1929. Courtesy Portland City Archives, A2001-062.65. 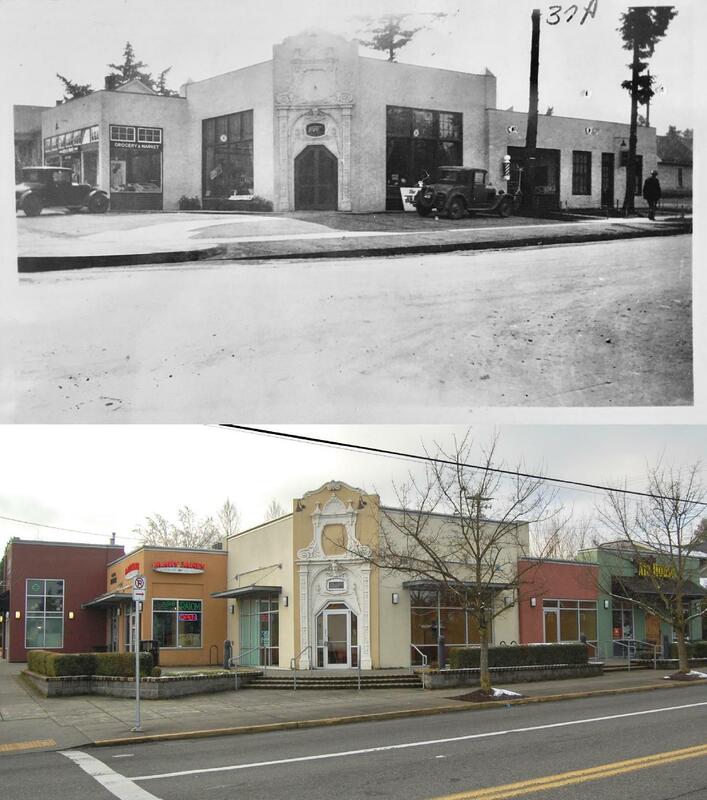 What was then a newly constructed building at the southwest corner of 33rd and Killingsworth, known as Hollinshead’s Corner, named for the developer who built the building. Looking southwest across Killingsworth. Note the entry archway and façade that is still standing. Photographed on September 30, 1929. Courtesy of Portland City Archives, A2001-062.67. The market at Hollinshead’s Corner, looking west across 33rd, just south of Killingsworth. The edge of the decorative archway is visible at far right. Photographed on September 30, 1929. Courtesy of Portland City Archives, A2001-0672.66. 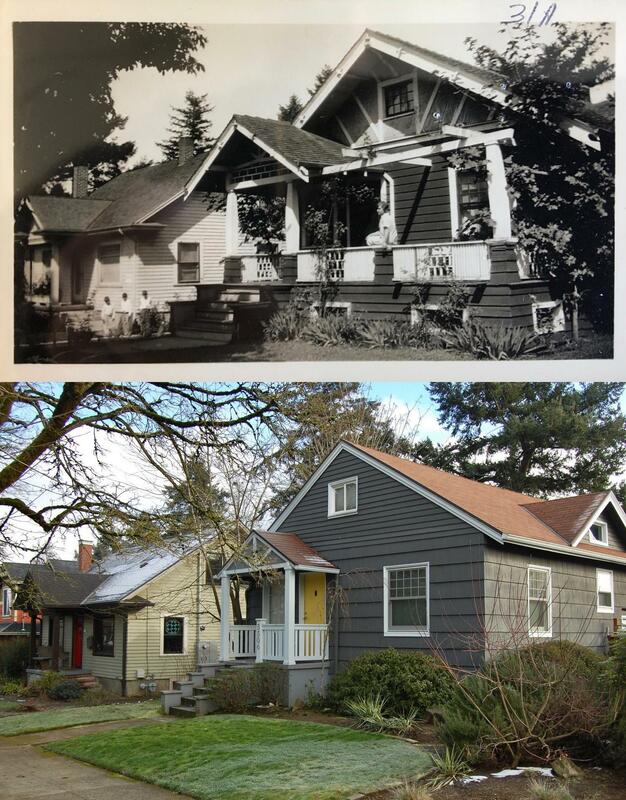 5343 NE 33rd and 5407 NE 33rd (formerly 1137 and 1139 E. 33rd Avenue, homes of Mrs. Mercier and H.C. Wright, respectively). Directly across from present day Canon’s Ribs. Photographed on August 30, 1929. Courtesy of Portland City Archives A2001-062.63. From The Oregonian, October 29, 1929. Because of the local turmoil and the fact that any Planning Commission recommendation would have to come before City Council for a vote, the electeds took the item off the agenda for several months, and then wanted to come out and have a look for themselves. 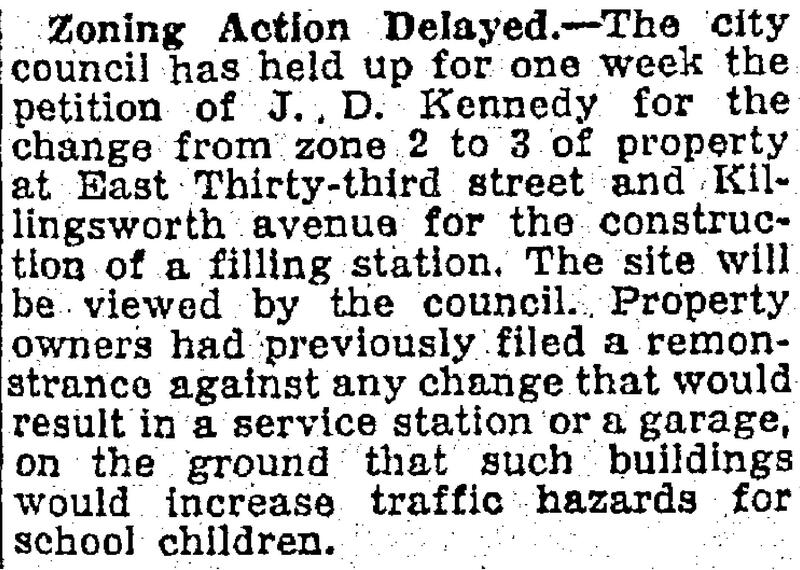 Action on Kennedy’s petition dragged into 1930. From The Oregonian, March 15, 1930. Inasmuch as the southeast and southwest corners of this intersection have been changed to zone three, the Planning Commission recommends this change be granted providing the petition agrees to set all buildings fifteen feet back from the street lines on both 33rd Street and Killingsworth Avenue. This requirement was agreed to by property owners on the south side of the street when their change was granted. Following the visit, Commissioner of Public Works A.L. Barbur recorded the following in support of Council’s eventual decision to approve the change. The members of the Council viewed the site of the proposed change of zone, and after careful consideration of the matter were of the opinion that the zone change should be allowed provided the property was used for either of the purposes outlined by the petitioner in his letter, and a fifteen-foot set back line established. Neighbors around 33rd and Killingsworth and teachers at Kennedy School couldn’t have been very happy, but the story fades into the background. The Great Depression intervened and the thought of any commercial construction was put on hold. Aerial photos from 1936, 1940 and 1951 show the intersection unchanged, Kennedy’s open field on the northeast corner still very much open. By 1956, filling stations had been built on both northeast and southeast corners, but Watson’s tidy bungalow was still there. From The Oregonian, July 1, 1932. Interesting how decisions from long ago do affect the way the landscape has turned out today (and the corollary that our decisions today shape future outcomes). Imagine if these council actions had been just the opposite, with 33rd and Knott transformed into a busy commercial intersection and Killingsworth and 33rd the quieter residential area. Next up: How other decisions made by John D. Kennedy gave Concordia some of the longest blocks in the area.